Citrulline Malate: helps boosts nitric-oxide levels, which can help widen your blood vessels, allowing more oxygen and nutrients to be delivered to your muscles. It also has a role in the removal of ammonia, a compound known to cause exercise-related fatigue, from your blood. 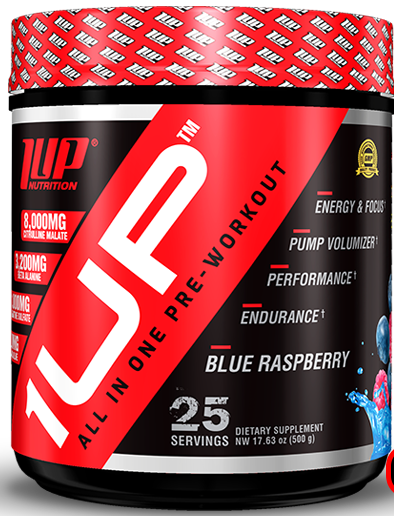 Combining Citrulline with Malate provides the one-two punch of transporting additional blood, oxygen and nutrients to exercising muscles, as well as providing amplified energy to boost performance levels. Carnosyn Beta Alanine is a naturally occurring amino acid that promotes strength, lean body mass and muscular endurance by supporting the pH of the muscle cells. In other words, it will help to buffer the acidic buildup that can occur in muscle, which allows you to maintain your strength, speed, and power for a longer period. In essence, you can train harder and longer because of it. Agmatine Sulfate (as AGmass™) promotes Nitric Oxide Production which helps widen your blood vessels to allow for greater blood flow and a greater amount of nutritional ingredients to your muscles. This in turn provides many benefits, including improved strength, vascularity & muscle fullness. L-Norvaline works by provides muscle tissue with massive amounts of oxygen and nutrients allowing you to achieve maximum pumps and keep producing nitric oxide throughout your workout. This makes your pumps stronger and longer lasting. 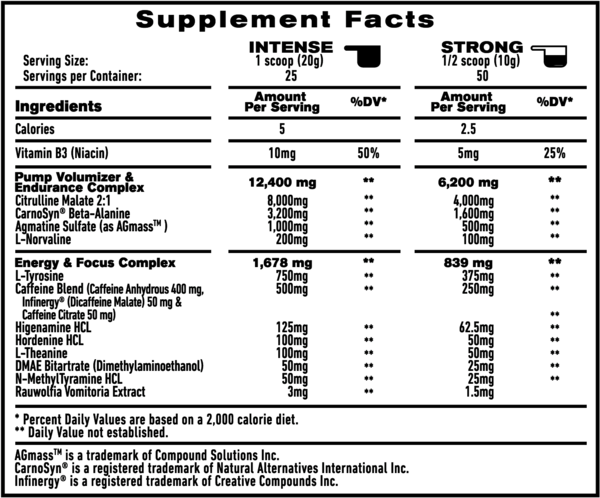 L-Tyrosine: an amino acid that supports the production of noradrenaline and dopamine, ultimately assisting in overall alertness, mental focus and the reduction of stress levels. Caffeine Blend: May help amplify your training intensity in the gym. Increased intensity means an increased metabolic rate and total caloric expenditure that can help prime your body for maximum fat utilization. L-Theanine: is a supplement found naturally in tea leaves. It is also an amino acid that has been shown to reduce stress, promote health, increase focus, and reduce anxiety. DMAE Bitartrate is an all-around cognitive enhancer.